The main reason I got the VFX-1 was to play System Shock on it. It is one of only a small handful of games which supports stereo 3D on the hardware in addition to the head tracking. This only works with the CD version which has built-in support out of the box. Head tracking is supported at all times and (if you have it switched on) stereo 3D when in full screen mode. Stereo 3D on the VFX-1 is incredibly convincing and far better than I’d hoped. Without the required glasses associated with your usual 3D technology, there is none of the image darkening resulting in a clean bright image. Nothing pops out of the screens as such but with such giant screens the added depth is all that is needed. Being able to explore Citadel station like this is just awesome. It makes the game far more atmospheric and should be the only way to experience System Shock. Unfortunately, it’s not all good. As mentioned in my review, the VFX-1 supported two 3D modes. 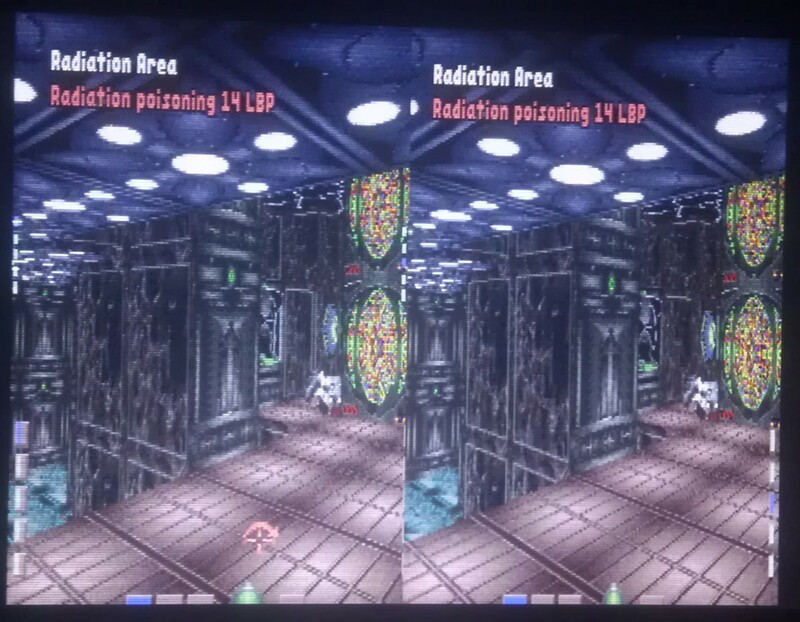 The alternate lines approach was introduced with new drivers well after the initial release and System Shock only supports the original side by side image mode. With the high horiztontal and low vertical resolutions of the VFX-1 LCD’s this is exactly the opposite of what is needed. The result of this is a very low resolution image which can only really support one of the pop up screens in the bottom corners at a time unless they overlap. This isn’t ideal but wouldn’t have been insurmountable and I could have easily lived with it. What is insurmountable is that the cursor flat out doesn’t work in stereo 3D mode.I have to aim way off to the bottom right to attempt to shoot or pick anything up that is straight in front of me. If anything is at the bottom right of the screen then it’s out of reach completely. With all the items to interact with, the game is totally unplayable like this. To make matters worse, when swapping back from full screen, the image on my monitor is fine but the headset remains in 3D mode making the screens garbled and unusable. If this one thing worked I could have swapped between the two modes as required, but no such luck. Resetting the headset requires a restart every time. This problem isn’t unique to me. The guy who wrote the VFX-1 FAQ 15 years back had to play the game in 2D also. This is a crying shame as it so nearly works and could have been fantastic. The only sections which I’m playing in 3D are the cyberspace bits which don’t need the mouse. The added 3D makes those wireframe corridors a lot less confusing as I can clearly see where they are in a 3D universe. The giant cyberspace heads are surprisingly scary when they are life-size and coming straight at you. With the 360 degree movement, head tracking is turned off in cyberspace and it’s only when it’s no longer there that you realise quite how much you were using it in the rest of the game. Other than cyberspace, I’ve been playing in 2D the whole way. This isn’t at all bad as it means I can play in SVGA and I’ve still got the head tracking. This is done in the same way as Terra Nova with a flexible neck allowing me to look sideways while walking forward. There is no indication of which direction I’m looking in though and it’s all too easy to end up looking slightly to the side of your starting position and walking like a crab. This hitch aside, the game is highly playable. The screens are still not as clear as I would really like but the head tracking works extremely well and combined with the giant image did draw me into the game more. I only had to swap to my monitor for reading notes and spotting cameras on the map, which weren’t always clear on the LCD’s. Much like Terra Nova being able to look up and down can be a big advantage. This was especially true on level 8 where I was craning my neck to spot the flying robots and hidden cyborgs in the higher reaches of the security level. With the head tracking, I’d also find myself tilting my head to get a better view when peeking around corners. Even without the 3D, all of this did add to the experience. The immersion did come with a price this time in that combined with some lengthy play sessions I did get very slight motion sickness, although I was only really aware of this after I stopped playing. System Shock is a huge game and if I was going to follow the advice and finish this in 15 minute sessions, I’d still be playing it a year later. I can’t be having that when I’ve got 3 more versions of Wing Commander lined up to play (among many other things). Besides which, the game quickly got me hooked again and I’ve been enjoying it far too much to quit just after I got started. Cyberpuck support was included. This worked ok for moving around but was more or less useless for doing anything else. Popping the puck down for a moment while doing something with the mouse would result in my character spinning round in circles. This would have left me trying to control my keyboard and mouse with my left hand, while using the puck in my right. Bearing in mind that I’m effectively blindfolded during all this, I unplugged the puck and stuck to conventional controls. This may well be the best game with VFX-1 support but I don’t think it was the best game to play on a VFX-1 I’m sorry to say. It seems to me that VR is suited to games where you don’t need to move your hands off set controls. It also needs to be a game where you don’t need to interact with complicated interfaces, read too much text, or spot small items/switches due to the limitations of the LCD’s. On this basis, I’m expecting Wings Of Glory to be the best of the 3 Origin/Looking Glass games with its joystick controls, lack of HUD and also the head-tracking being a far more useful component of gameplay. Playing System Shock for only the second time, it’s suprising how dry an experience it is. There isn’t all that much text/dialog, there are no stats, no upgrades, etc. It’s basically an FPS with a big inventory but I think the gameplay stands up extremely well for all that with plenty of options on how to play. There is so much more freedom than your typical modern FPS with massive levels to explore as you please. The controls are still far from ideal at the best of times and do detract from the experience. The ending of System Shock is as much of a letdown as I remembered but other than that it’s still a great game. I’ve never tried it but I expect the best way to experience the game would be to bypass the original controls entirely with the fan-made mouse look patch. The better controls would probably outweigh the gains from the VFX-1 but the VFX-1 is still a great option be it in 3D or not. I do think other FPS’s like Quake and Dark Forces would work better on it due to their simpler nature and I’m looking forward to trying some of them out. I’ll leave the VFX-1 for now and give my eyes a rest. I can’t seem to get enough Wing Commander lately and will pick another port of that next. Pingback: The original System Shock is now on GOG - How to do everything!